Do you have a handkerchief? You're going to want a handkerchief. And a glass of water. And I don't know, a Xanax or something, because Monday is too early in the week to hit anyone with probably the cutest thing you will see in your entire life before Wednesday. The baby elephants, born to their mother, Curve (omg whatwhatwhat) on the Pongola Game Reserve, seem to be having a good time and adjusting well. More importantly, however, they're also bringing joy into the hearts of literally everyone who sees them. 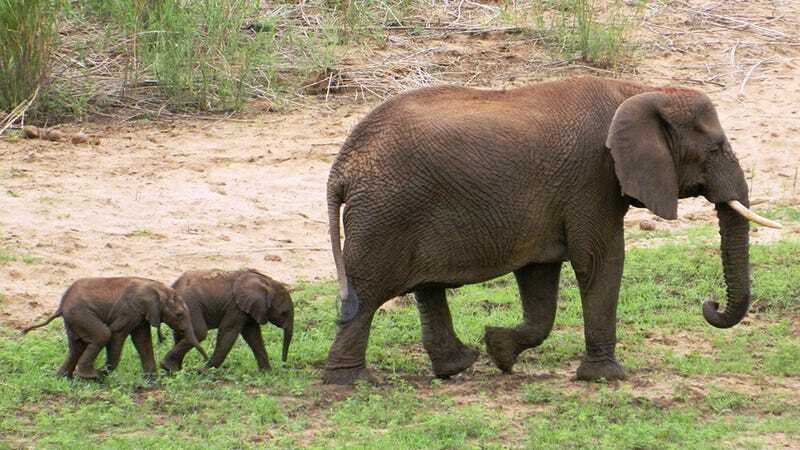 BuzzFeed reports that when twin elephants (which are so rare that they happen "only .5 percent of the time") are born, other elephants actually help the mother take care of them, which omgwhatwhatwhat. I sent this story to my partner, who many of you will remember loves baby elephants more than any other baby animal — he's tried baby giraffes, it just isn't the same — and he told me he had to leave the office for a few minutes because all of this was just too much for him to handle. He also reports that the baby elephants are now his wallpaper and that he thinks he will stroke them when he is feeling stressed. Baby elephants: healing all wounds. Forever.